I’m a bit of a gear nut. My rig is filled with expensive pedals, vintage amplifiers, and more patch cables than God ever intended. My pedalboard is a source of pride. It does my heart great joy whenever I play a show and a crowd of gearheads gathers around my gear with their mouths agape. But with its massive size, comes one massive drawback: inconvenience. The board alone weighs in around seventy pounds. Each amp is around forty, and then I have a bag filled with cables to hook it all together. And after playing a show, the last thing I want to do is haul all of that out of my car, into the house, and down the stairs into my music room. It’s not unusual for me to leave my rig in my car for a week because I have another show coming up and what’s the point if I’m just gonna have to carry it all back upstairs? Many guitarists have a separate practice rig for this exact reason, but that’s a bit outside my price range. I’ve toyed with the idea of looking up loan options on the Credit Review to finance a dedicated practice rig, but I’m pretty sure my wife would kill me. So I often resign myself to just playing an unplugged electric without any sort of amplification (I usually leave my acoustic at the church). And as someone who plays a lot of atmospheric, effects-heavy music, that leaves me feeling a bit toothless. To that tension, guitarist turned engineer Chris Prendergast designed the Jamstack, billed as the world’s first attachable guitar amp. Of course, the Jamstack is not the first micro-amp on the market. There have been legions of companies that have released small speakers and pretended like it was going to change the industry forever. I even had an electric guitar with a built-in amp when I was in eighth grade. Portable amps have been available since the 1960s. In fact, I’m pretty sure I’ve seen a picture of George Harrison using one. To be honest, this long line of underwhelming products tainted my expectations for the Jamstack. But I was very pleasantly surprised to find that the Jamstack might be the first portable amp that actually delivers on its promises. Right out of the box, the Jamstack is a pretty machine. It’s a compact speaker about eight inches long, with a silver nameplate and a black matte finish. 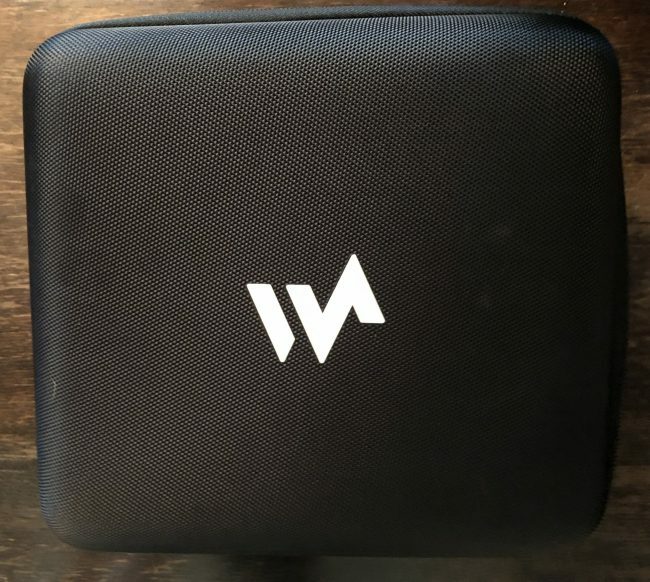 It ships in a compact carrying case with spots for the amp and all accessories. 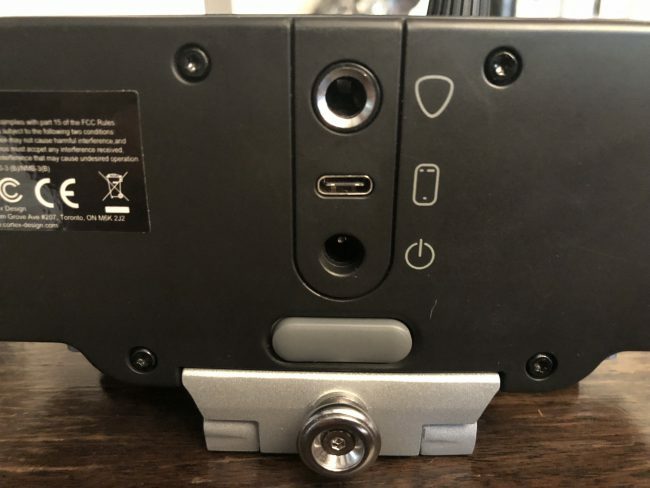 The speaker itself has a volume knob and three buttons, labeled with symbols (the third is for Bluetooth), and a headphone jack. 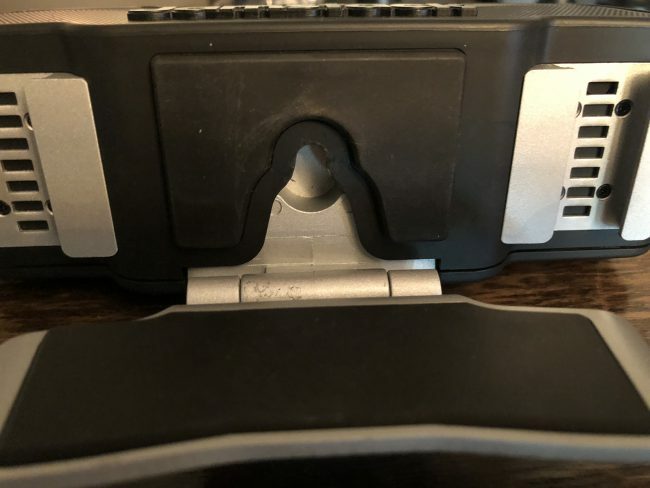 On the back, there are three jacks: one for power, a USB-C cord to connect to a smartphone, and one for a standard 1/4″ guitar cable. All cables are included. 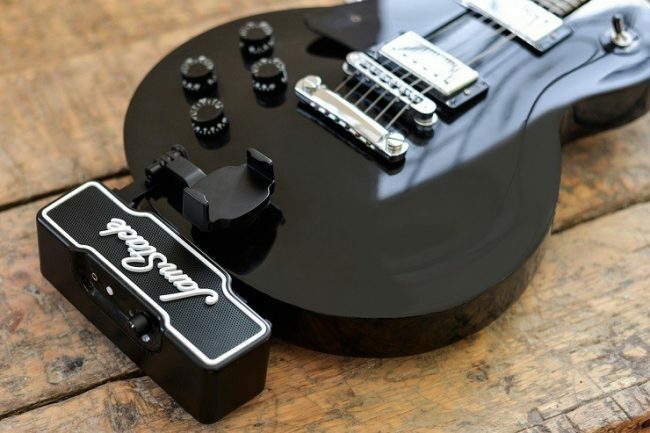 There is a mount to connect a smartphone to the Jamstack, which can be attached to either end of the amp, making it perfect for left-handed guitarists as well. There is a hole on the underside to hook onto the strap button, which attaches it to the guitar. There’s a separate strap button on the Jamstack so you can still use a strap with it. The silver “flap” in the picture above is spring-loaded, which keeps the Jamstack steady against the body of the guitar. However, the hole is only large enough to accommodate a standard strap button. I have strap locks on most of my guitars, so the Jamstack can only attach to the one guitar I own that doesn’t have strap locks. Looking at the Jamstack for the first time, it’s a little difficult to figure it out on your own. Luckily, they included a very clear manual that walks you through the process of connecting it and getting it started. 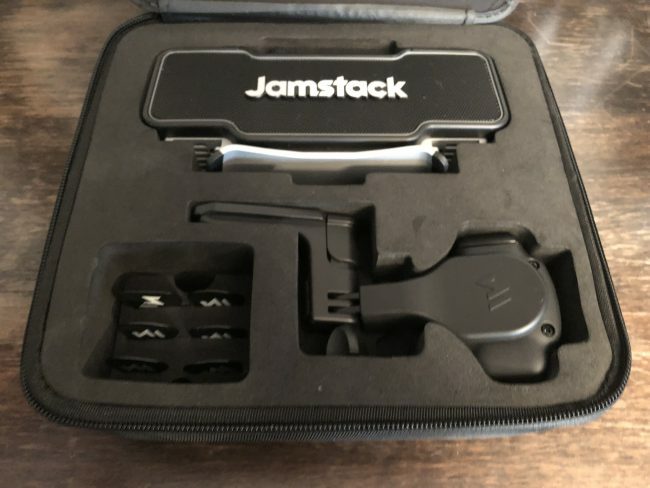 The Jamstack can be used without a phone. It’s easy to plug a guitar in and get going with a completely dry signal. But connecting your smartphone opens up a wide range of possibilities. There are tons of apps on the market that model different effects pedals and amplifiers. Jamstack even has a list of recommendations on their website. Most of these apps are designed to be used with a recording interface, which would require a separate speaker or headphones. But the Jamstack amplifies these apps without any additional equipment, allowing you to get high-quality effects without plugging anything else in. In a couple of hours of tinkering around, the only problems I had were with the apps themselves. I started off with ToneBridge, which the QR code in the manual took me to. It took me a while to get my analog-based brain around the virtual pedalboard on the app, and honestly, I’m still on the lookout for another app that I might like a little better. But the Jamstack itself works exactly as promised. Even though I wish its max volume was a little louder (I crank my amps, to the chagrin of my wife), it sounds fantastic. It has a rich tone that amplifies frequencies across the signal range. I’m especially impressed at how deep the low-end is for such a small speaker. You can also play a song through your phone and play along with the effects, which was the impetus of the Jamstack’s creation in the first place. I’ll often listen to a song in one ear from headphones while I play along on my amps, but the Jamstack plays both at the same time, and the speaker never sounds like it’s overloaded or crowded. The sound is crisp and clear even when the music and the effects are cranked. By that same token, this amp also functions as a standalone Bluetooth speaker when you’re not playing guitar. Although, I haven’t been able to get the Bluetooth connection working while the guitar is plugged in. It works fine on its own as a Bluetooth speaker, though. There’s a good chance that I’m missing a step. Obviously, the Jamstack is no replacement for a performing guitar rig. But it doesn’t pretend to be. If you’re just looking for a solution to practice without the hassle of dragging around a bunch of gear and cables though, the Jamstack is exactly what you’re looking for. I’ll probably leave this on a spare guitar in the living room and noodle around when I’m bored—which, as any guitarist can tell you, is when all the best ideas come out. The Jamstack retails for $250, but it is available for a pre-order price of $199 from Jamstack’s website.